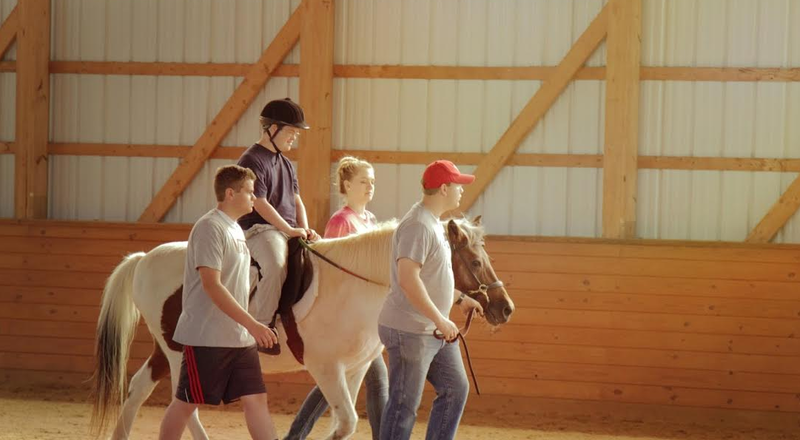 Madison House Autism Foundation operates a state-of-the-art therapeutic riding center located in Dickerson, Maryland at Madison Fields. Our mission is to foster a nurturing and healing partnership between the horse and rider to enhance the wellbeing of individuals with special needs. We serve riders with autism, cerebral palsy, developmental delays, speech, vision, and/or hearing impairments, traumatic brain injuries, and wounded war veterans. This program is staffed by credentialed professionals and trained volunteers dedicated to providing the finest in safe, fun, and effective riding sessions. A member of the Professional Association of Therapeutic Horsemanship International (PATH), our facility is designed in accordance with PATH’s stringent safety guidelines. Features include a drive-through porte-chochere entranceway, allowing participants to exit and reenter their vehicle while under cover. Once inside the building, there are two heated observation lounges with viewing windows, an indoor arena with dust-free footing, a wheelchair accessible mounting ramp, an office kitchen, a physical therapy room/classroom, a conference room, a library, and a six-stall barn. There is an outdoor riding ring and woodland trails. A sensory trail will be built in the near future. More exciting details about this new program are forthcoming, though we are currently accepting new students for general, therapeutic, and group riding lessons. To schedule a tour, please call Madison Fields at (301)349-4007. For more information, including the riding schedule and fees, please fill out the form below. I want more information about how I can get involved. I’m interested in the therapeutic riding program.